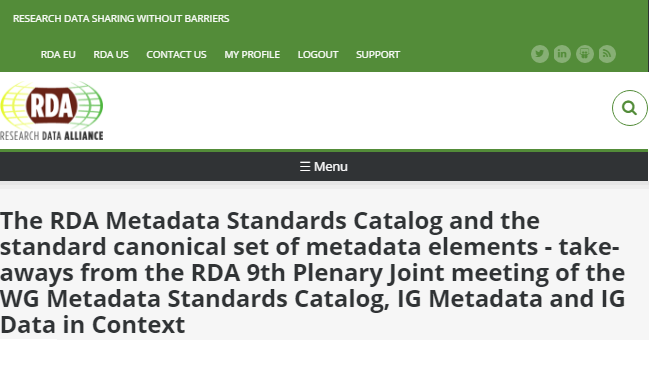 The Metadata Standards Catalog Working Group is working on the next generation of the RDA Metadata Standards Directory, and is scheduled to deliver the new Catalog in mid-2017. Alex Ball explained how the group is evolving and migrating the data from one to the other, and gave a demonstration of the current version of the Catalog. Among the improvements are a dynamic search interface, a richer subject classification, and an API for automated access. A transcript of the demonstration is available on the Working Group wiki. Over the past few plenaries, the Metadata Interest Group has been developing a set of metadata elements. The idea of the set is to specify the information that systems need to have in order to satisfy the use cases collected by the Data in Context Interest Group. The hope is that this set could be used to characterize existing metadata schemes and facilitate mappings between them. By Plenary 8, the group had identified 17 high-level elements. Keith Jeffery explained that the next step was to 'unpack' these general elements, and produce lists of sub-elements that more closely resemble how the elements might be represented in a real metadata scheme. He demonstrated by providing a decomposition of spatial coordinates. Rebecca Koskela then led the group in tackling the rest of the list; the results of the activity can be viewed here. These initial lists will be refined over the course of the next six months in a series of teleconferences. If you would like to be involved, please check the Metadata Interest Group mailing list for details of when and how to join the calls.